No nonsense, Electromatic hollow-body guitars are the perfect real, pure and powerful Gretsch instruments. The G5422TG has a thinner, fully hollow build with a true Filter'Tron voice that captures the resonant hollow-body sound with a more present and chiming voice. 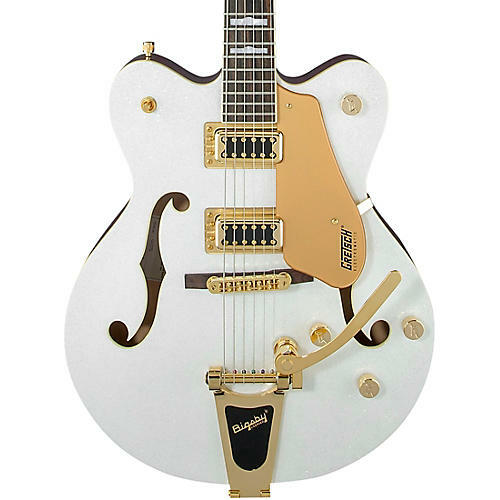 Like all Electromatic guitars, it delivers the fearless and electrifying authenticity that has set Gretsch apart as the quintessential rock & roll guitars from the very beginning. It's the sound of honor itself - play proud. Premium features include dual Black Top Filter'Tron humbucking pickups, versatile upgraded controls including master volume treble bleed circuit, oversized bound F holes and aged multi-ply body binding, smaller late-'50s G6120 bound headstock, Graph Tech NuBone nut, pearloid hump-block inlays, and a Bigsby B60 vibrato tailpiece.